Batman’s not an easy character to own. The point being, Scott Snyder didn’t have much of a chance. And yet, despite the impossibly high expectations, and the 4 competing Batman comic lines within DC at the start of the new 52, Scott Snyder has established himself as the premier writer of everyone’s favorite Dark Knight. Easy to forget this now, but at the time of DC’s New 52 launch, I was under the impression Detective Comics was going to be their flagship Batman book. After all, much like Action Comics and its MEGA-NAME-AUTHOR Grant Morrison, Detective Comics was the original home of Bruce Wayne. It was a much bigger deal to renumber Detective Comics with a new number one than it was to toss in the banal simplicity of a new number one Batman. Not only that, but the first issue of Detective Comics made waves with the crazy Joker doing crazy cutting things to his own face. Batman? Bruce fought alongside the Joker… who turned out to be Nightwing in Arkham Asylum. It was a fun debut, but very inauspicious at the time. Here we are 12 issues and a #0 origin flashback later and Scott Snyder’s Batman is not only a consensus favorite among the DC new 52, it’s in consideration for best ongoing comic of the year. Period. How did Snyder and artist Greg Capullo pull it off? Not many DC creative teams had as much success with this concept as Snyder and Capullo on Batman. 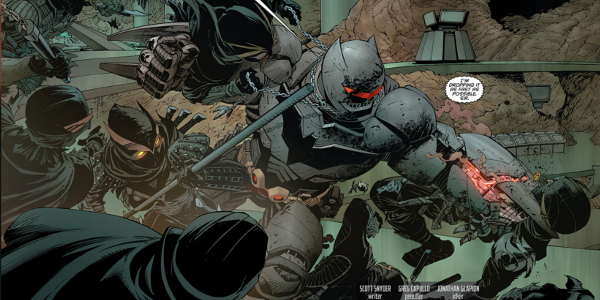 Rather than launch with a familiar Batman villain, Snyder and Capullo captured the essence of Bruce Wayne and Gotham – dark, gritty, constantly at war – and gave it a whole new storyline based around the Court of Owls. By giving the Court of Owls deep-seeded roots in Gotham, Snyder was able to add a whole new level to the history and character of DC’s favorite city. This has even extended to the only bonus, “end of the comic” add-on worth reading. Snyder’s additional history created through previous Wayne manor butler Jarvis Pennyworth (father to Alfred), weaves the Owl’s Talons with Bruce Wayne’s genealogy in a way that actually adds significant detail to the story. In just 12 issues, Snyder has done more with the Wayne family lineage and the history of Gotham than could have reasonably been expected. Most importantly, when it came time to reveal the big, secret cameo-villain that provided a familiar face to readers everywhere, Snyder and Capullo created a brand new villain behind the Court of the Owls. This might not sound like much, but keeping the new 52 about a level of pure creativity – about making the old new again – and doing it well, is by far the most exciting thing about Batman. The character is so beloved because of the things we have read in the past, but that doesn’t mean Batman fans don’t want to make new memories. It’s been very refreshing to see the comic book community respond so positively to creative, endlessly entertaining revision. End of the day, that’s what ongoing superhero comics are all about. The whole thing is a perfect blend of tough, unflinching Batman, who’s always smart enough to find a way to win an impossible situation. And somehow, even though it’s Batman and you know he cannot die that would be stupid, there’s some serious emotional tension. Having said all that, the best moment of the run has to be the trippy, broken Bat madness of issue #5. Trapped inside an endless labyrinth constructed by the Court of Owls, Batman is starved, raving mad, and hopelessly lost. Not only is this an incredible broken Bat story, but Snyder and Capullo play with some ridiculously fun crafting, turning panels upside down and sideways to emulate the madness of this labyrinth. If you’re interested in comic book form even a little, this issue alone is worth the whole volume. What Does Issue #0 Tell Us About Batman’s Future? 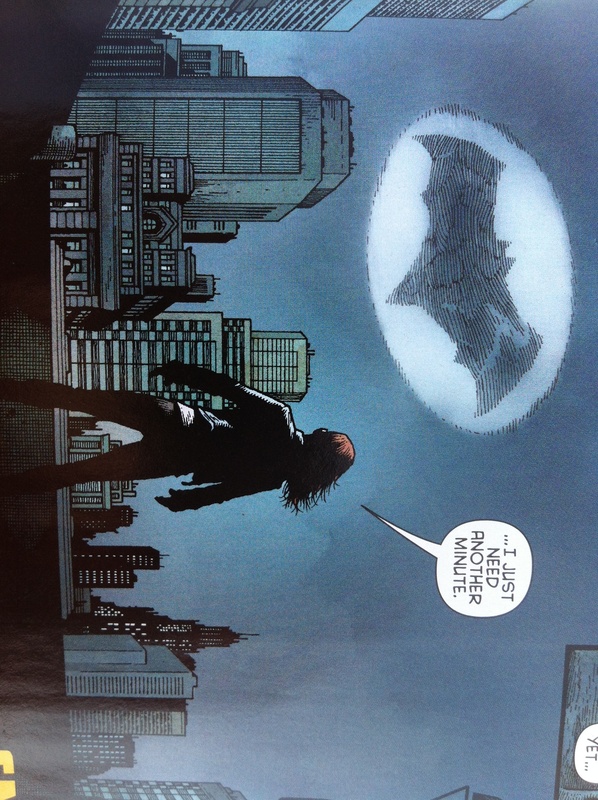 My initial read of Batman #0 was largely disappointing. Although I’m higher on the issue after a second read (have it in the 7.3/10 range), its familiarity leans a little too close to stale – the exact opposite of everything I just described in the opening twelve issues. That said, you can see what DC and Snyder are doing here with the introduction of the Red Hood Gang as Batman establishes himself for the first time in Gotham City. DC’s already hyping “the return of the Joker” in Batman #13, and as our class reading of The Killing Joke reminds us, Red Hood Gang almost certainly means Joker. So although there’s not a lot new going on in the primary storyline of issue #0 (Commissioner Gordon talks to Bruce Wayne about an up and coming vigilante, Batman messes up while infiltrating the Red Hood Gang, Alfred is dryly sassy about maintaining a Crime Alley Batcave), the fact that it’s leading towards a Snyder Joker arc is preposterously exciting. If you’re thinking about starting Batman ongoing with issue #0, I’d recommend you 1) buy the Court of Owls Trade and 2) wait until the Joker arc starts with #13. 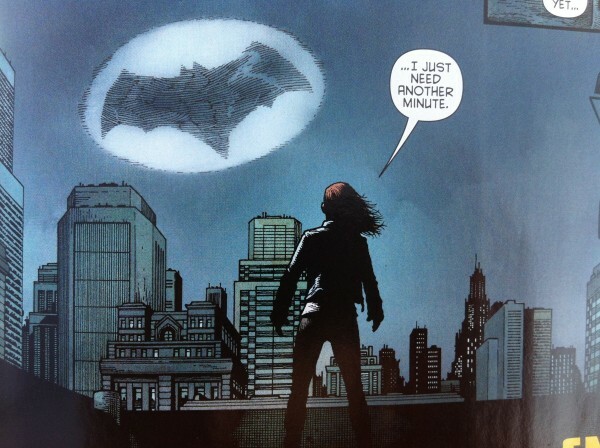 I enjoyed the add-on comic with all 3 Robins and Batgirl being introduced to the Bat signal for the first time, but otherwise there’s not much new here. Fortunately, that’s about the first time we’ve been able to say that about Snyder and Capullo’s Batman. I’d suspect it’s not the last either. This could be one for the history books.